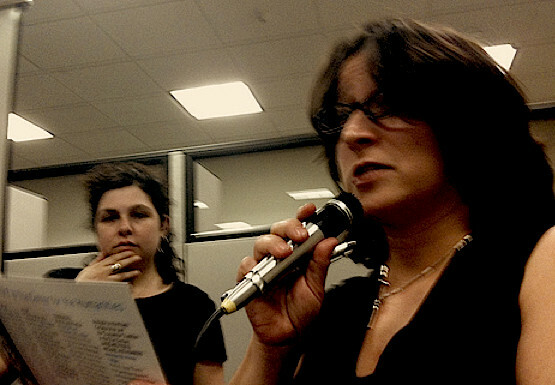 erica kaufman and Rachel Levitsky. A reading series and independent press that promotes the work of women writers who are adventurous, experimental, politically involved, multi-form, multicultural, multi-gendered, impossible to define, delicious to talk about, unpredictable, and dangerous with language, Belladonna* was founded as a reading and salon series by Rachel Levitsky at Bluestocking’s Women's Bookstore on New York City’s Lower East Side in 1999. In 2000, in collaboration with Boog Literature, Belladonna* began to publish commemorative “chaplets” of the readers’ work. Erica Kaufman joined Levitsky as cocurator/editor in 2002. Then in 2005, the series moved its events to the downtown performance venue, Dixon Place. This episode of PennSound podcasts is introduced by Amaris Cuchanski, edited by Nick De Fina, and produced by Al Filreis. Be sure to listen to any or all of the other twenty-seven podcasts in the series.